The power of social technology can be nothing short of revolutionary. In 2008 for example, the Red Cross raised more than $30 million for Haiti through SMS donations. Technologies that enable us to poke our friends or retweet a kitty picture are also able to connect and mobilize us to bring about change. What differentiates those harnessing social media for something more impactful than procrastination? Contrary to what you may think, promoting a personal goal is inherently social. To be successful, however, you must translate passion into a powerful story and tell it in a way that generates contagious energy. By doing this, you generate participation, networking, growth, and ripple effects—combining to form a movement that people feel they are a part of. Your personal goal then becomes collective. 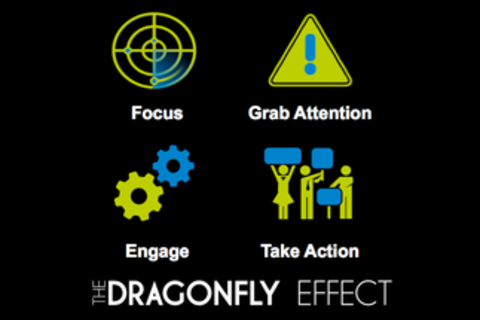 Drawing on psychological research, The Dragonfly Effect provides a framework to show you how to do this through four key skills—Focus, Grab Attention, Engage, and Take Action. Andy Smith co-authored The Dragonfly Effect: Quick, Effective, and Powerful Ways To Use Social Media to Drive Social Change, a book that Daniel Pink called “the single best road map to social media I have ever seen.” Andy serves as principal of Vonavona Ventures, where he advises and bootstraps technical and social ventures with guidance in marketing, customer strategy and operations. He previously led marketing teams at Dolby Labs, BIGWORDS, LiquidWit, Intel, Analysis Group, Polaroid, Integral Inc. and PriceWaterhouseCoopers. When guest lecturing at Stanford’s Graduate School of Business and other institutions, Andy speaks on social technology, human-centered design, storytelling and brand building. He has appeared as an expert on programs including Bloomberg West and NBC’s Press: Here and moderated GE's live Ask Anything online conversation for their Ecomagination Challenge. He’s spoken to audiences at the Web 2.0 Expo, SXSW, The Warm Gun Conference (presented by 500Startups), The 140 Characters Conference, Social Media Breakfast, NCG’s 2011 Corporate Philanthropy Institute, World 50 and Marketing Week. Andy is a contributor to GOOD, where he writes about businesses that embrace and integrate a social mission. His work has also appeared in Fast Company, Psychology Today, OPENForum, McKinsey Quarterly and Stanford Social Innovation Review. Andy was selected by the White House to provide guidance to the Obama administration’s White Business Council. An advisor to a score of organizations including FuseCorps and ranging in size from startups to Kraft Foods and Procter and Gamble, Andy is also a board member of The Glue Network, CafeGive, 140Proof, One Family One Meal, ManCrates and Bettermint. A permanent transplant to the Bay Area from New Jersey, Andy has studied in The Parthenon, lived in a former South African prison, and counts a regiment of Windsor Castle’s Scots Guards among his friends. Andy is a dad, a gardener, a gadgeteer and a serious tech geek. Once bumped from a flight that tragically crashed, he has since learned to accept travel mishaps, and most everything else, with equanimity. Andy earned his MBA from The Anderson School of Management at UCLA and holds a degree in economics from Pomona College.